It’s that time of year, and I’ve been working on holiday card designs. 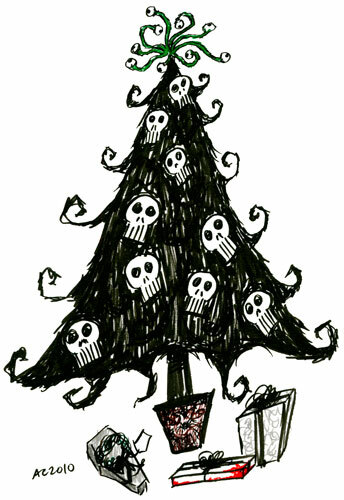 In addition to my usual stock of Lovecraftian horrors, I decided to do a cheerfully morbid Christmas tree. Skulls adorn the branches and it’s topped with an eye-tipped vine. There’s a bloodstained package among the gifts under the tree, and the curly, swirly, tentacle-ish branches are reaching down to help distribute them. 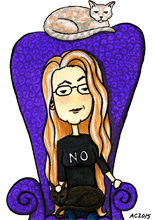 You can pick up some of these cards for your own holidays at Etsy, or buy the original below. Goth Christmas Tree, 5″x7″ pen and ink on watercolor paper. I’m a mid-life future artist. Trying to learn the basics and find my style. Love your unique style! Thanks! Good luck in your endeavors.